India is a land of festivals. It encompasses people from different religions and cultures and thus celebrates numerous religious festivals. The entire atmosphere is filled with joy and enthusiasm during the festive season. “The Belle Époque meets the Age of Instagram” is the headline the New York Times recently used to describe Baden-Baden – and it is certainly true that today the city’s rich history blends seamlessly with a highly contemporary lifestyle. This lifestyle is also reflected in the new claim of the city called “The good-good life”. This claim is also a promise to all international guests. Summer 2019 marks the 200th anniversary of the second edition of the Grimm fairytales, the first time the story of the fearless four appeared. The fairytale festivities will take place from March to October. From 23 March to 1 September 2019. Tempting aromas, the festive glow, all the wonderful sounds of the season and delicious yuletide treats. will appeal to every one of your senses. Throughout Germany, Christmas markets celebrate seasonal customs and traditions in delightful historical settings. Particularly popular with visitors are Nuremberg's Christkindlesmarkt and the Striezelmarkt in Dresden. In August, the Telegraph published the list of the 10 world’s best autumn escapes and we were thrilled to hear that the Julian Alps were among them. But the aim of this newsletter is to tell you that there are many other destinations in Slovenia which are more than worth visiting. Golden shades of leaves create this magical, calming feeling, which turns diverse landscapes into magical, almost fairy-tale like places. It seems that summer has reached its peak. Not only in terms of temperatures, but also in terms of the atmosphere. Numerous festivals are taking place now and cheerful gatherings with friends make summer nights so special and worthwhile. If you're in a cultural mood, head to Kamnik, the venue of KamFest, an 8-day open-air festival, which starts today. If you're more into nature and in search of some hidden spots, we also reveal the location of the recently opened biological swimming pool. Events in Bremen for the late summer and beginning of the autumn: August, September and October Agenda. 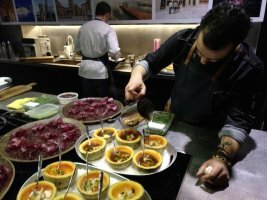 Nine Valencian chefs have invited as many colleagues to cook “four hands” menus based on product that you can taste from February the 25th till March 3rd. The second edition of Valencia Culinary Meeting has arrived. For seven days, chef duets will be cooking produce-centred menus focusing on local yet universal gastronomy and promoting the love of good food as a global value. Slovenia holds a long tradition of Carnival celebrations. The door-to-door rounds of Kurenti are a unique feature of the Carnival season and Slovenia and have been as such been put on the UNESCO Representative List of the Intangible Cultural Heritage of Humanity.